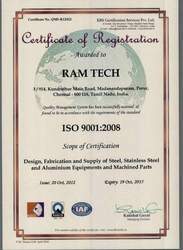 Incorporated in the year 2005, we, “Ram Tech”, are an ISO 9001:2008 certified manufacturer and supplier of an exemplary array of Industrial Process Equipment and Fabrication Services.Our product range includes Process Reactors, Heat Exchangers, Industrial Conveyors, Pressure Vessel, Storage Tanks, Blender Blades, Chemical Filter, Centrifugal Fans, and Industrial Cooler. In addition to this, we are providing Stainless Steel and Aluminium Fabrication Services which are highly cost effective, reliable, flexible and timely executed by our experts. These products are engineered implementing sophisticated technologies with top-grade components and raw material. For their low maintenance, prolonged service life, corrosion resistance, high tensile strength, seamless finish and dimensional accuracy, these products are used in various industries. Offered products are highly demanded in Petroleum, Gas Plants, Food, Dairy and numerous other industries. Supported by a team of distinguished professionals, our firm has been able to to be recognized all over the nation. We are backed by state of the art infrastructure well-quipped with advanced machines and equipment. These tools are utilized by our professionals to bring forth a quality-assured product line into the market. Our professionals ensure the product delivered to the clients must be qualitative, flawless and long lasting so as to cater to the needs of the patrons. We have garnered a huge client-base across the country owing to our ethical business policies and commitment towards quality. Owing to the dedication and best efforts of our mentor, “Mr. V. Ramachandran”, we have been able to expand our business operations all over the country. Today, we are present in numerous major markets only because of our mentors' excellent managerial skills. Owing to the dedicated efforts of our employees, we have been able to establish ourselves as a leading manufacturer and supplier of a wide array of Process Reactors, Heat Exchangers, Pressure Vessel and Industrial Cooler. We designed these products keeping in mind their wide industrial applications. Our products coveted in chemical, food & beverages, auto-mobile. We are also providing Stainless Steel and Aluminium Fabrication Services so as to cater to the demands of our clients. Strictly as per the clients' demands, we are providing commissioning, erection and installation services. To manufacture and supply our range of Process Reactors, Heat Exchangers, Pressure Vessel and Industrial Cooler and provide world class Stainless Steel and Aluminium Fabrication Services, we have appointed a team of highly diligent professionals. Our professionals are highly experienced in this domain and possess in-depth knowledge of the manufacturing science. Owing to their immense technical expertize, we have been able to complete our assignments within given time frame. Moreover, we conduct various training programs to groom their knowledge and technical expertise. Catering to the demands of various industries, we are engaged in manufacturing and supplying a broad array of Process Reactors, Heat Exchangers, Pressure Vessel and Industrial Cooler. All these products are designed as per the industry requirements so as tom ensure their wide applications in various equipment. Despite huge competition in the market, we have been adroit to secure an exclusive position in the market. We are leading organization with main focus on quality and optimum patron-satisfaction. Backed by our rich infrastructural facilities and manpower, we have been able to cater to the needs of varied industries. We always follow ethical business policies and all the deals signed with the clients are assured to be highly transparent.